1-877-Appliance specializes in refrigerator/vine cooler repair, and we can fix most brands and models of refrigerators including Tresanti, NewAir, Haier, EdgeStar, Amcor, Amana, Kenmore, General Electric, Whirlpool, Frigidaire, , Electrolux, U-Line, KitchenAid, and more. Call 1-877-277-5426 now and save 10% on fast, reliable, professional refrigerator repair.A wine cooler is the perfect appliance for novice wine drinkers and collectors. It preserves the taste and quality of white and red wines by carefully controlling storage temperature and humidity levels. To ensure efficiency, optimal performance and long-lasting durability, wine chillers must be properly maintained and cared for. Here are some quick and easy maintenance and care tips for your portable unit. One of the most important maintenance and care tips for your cooler is exterior and interior cleaning. 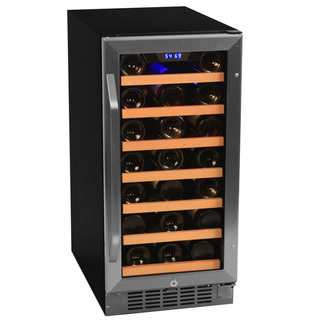 Following these simple tips will keep your wine cooler in great operating condition. Remember, never clean with flammable fluids because they can cause a fire or an explosion. Always read the owner's manual included with the unit before use. All of these factors contribute to your wine cooler's ability to maintain a constant temperature. To ensure proper wine storage, you need to make sure the temperature is consistent. Maintaining a precise temperature and humidity level is the most important part of wine preservation and storage.